On April 7th I participated in the British Society for Literature and Science annual conference at Oxford Brookes University, with a paper entitled Out of the Comfort Zone. Dan Brown’s Origin as a standpoint on literature and science. What follows is the text of my talk. In his last novel Origin, the bestselling author Dan Brown imagines that an acclaimed scientist and futurist, whose name is Edmond Kirsch, is about to announce a disrupting scientific discovery on the origin of life. Right before the spectacular presentation of his research, Kirsch tells his long-time friend and old-fashioned humanities scholar Robert Langdon, the main character of several Dan Brown’s novels, including the groundbreaking Da Vinci Code: «Tonight is all about pushing people outside their comfort zones». Similarly, the novel itself can push literary criticism and the humanities outside the comfort zone of their acknowledged interpretative practices, usually at unease with the analysis of such cultural objects, socially meaningful but aesthetically controversial. For sure, it pushes me out of the comfort zone of my research on Italian Studies, unfamiliar with popular and science fiction. Still, I decided to take-up Dan Brown’s challenge and displaced myself to look at the relationships between literature and science from the standpoint of a popular bestseller novel. To learn from the bestseller, where outstanding scientific discoveries are both simplified and overstated to fit into an appealing narrative framework, how literature and the humanities could address the major challenges entailed in the current scientific debate. To assume the point of view of the bestseller, I’ll undergo three significant displacements in this presentation. First, from the standpoint of the bestseller, I’ll look at how Western society is shaken by a massive clash between the traditional, humanities-driven organisation of culture and the disruptions triggered by scientific knowledge and technology. Second, from the standpoint of the bestseller, I’ll look at how correlations can be established between cultural forms and biological processes, history of arts and history of evolution. Indeed, though in a simplified fashion the novel suggests that hypotheses can be made about the biological underpinnings of creativity and the evolutionary significance of art. Third, from the standpoint of the bestseller, I’ll look at how literature can embody scientific insights and become a channel of popularisation and cultural elaboration of scientific research and discoveries. First displacement. As it is often the case with popular culture, Origin unveils conflicts and tensions harboured into the unconscious of collective imagination. And while the novel seems to reproduce Dan Brown’s usual conflict between enlightened science and regressive religion, I argue that a deeper and more complex confrontation is represented this time. That is, the tearing battle of past and future, tradition and innovation. Brown represents the ancient, weary civilisation shaped by humanistic culture challenged by an utterly new civilisation, tech-driven and shaped by science. The screen now showed a photo of a dusty library shelf, where leather-bound tomes on ancient mythology languished in the dark beside books on nature worship, Baal, Inana, Osiris, and innumerable early theologies. 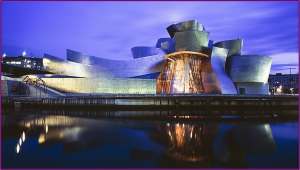 Montserrat’s library is opposed in the first place to the Bilbao Guggenheim Museum, where Edmond’s presentation is showcased, and which is the architectural translation of post-humanism. «This building doesn’t just break the rules […] It ignores them completely», observes Langdon accessing the space. Langdon here represents the astonished witness of traditional culture, ironically defining himself a classicist, who does better with Da Vinci than with de Kooning. A statement that is, of course, a winking to the reader of Dan Brown’s best-known novel, the Da Vinci Code. The super-smart professor, and consequently the reader who is familiar with him, are both the repositories of a type of knowledge which is going to be radically challenged. 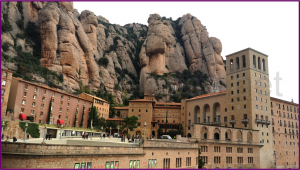 Montserrat’s library is also opposed to the library Edmond Kirsch builds in Gaudì’s Casa Milà in Barcelona, the headquarter he chooses to elaborate his discovery. Edmond had transformed a wide section of curved hallway into a stunning library by building shelves between the vertical supports of Gaudì’s vaults. 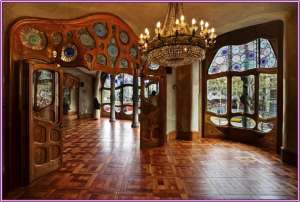 This particular library, endowed with the most updated scientific knowledge, along with inspirational artistic books, adheres to Gaudi’s architecture, which in its turn follows the rule of nature and biology. The architectonical confrontation of past and future is also represented in the last section of the novel. 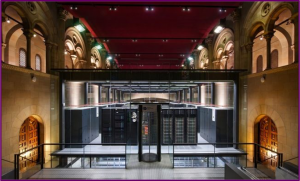 To release Edmond Kirsch’s discovery, of course obstructed and delayed by obscure powers, Langdon ends up in the Barcelona Supercomputing Centre, that is, a high-tech lab built inside a decommissioned Catholic church. The superimposition of a church and a lab, the supercomputer invading the space of God, is a rather bold representation of two ideas of knowledge fighting each other. A similar dualism of what is old and what is new is reproduced inside the lab, where the actually existing Supercomputer Mare Nostrum is represented as an old machine: huge, heavily cabled, noisy. On the contrary, on the second floor of the lab is displayed Edmond’s quantic computer E-Wave, «a massive metallic blue-gray cube – ten feet square – with no wires, no blinking lights, and nothing about it to suggest it could possibly be a cutting-edge computer». 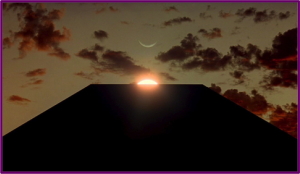 E-Wave is also defined as a «metallic monolith», with a clear echo of the mysterious black monolith from 2001 Space Odyssey, a movie in which a series of evolutionary leaps are represented. The combination of Mare Nostrum and E-Wave is the device through which Kirsch can boost his findings. The two computers reproduce the functioning of the bicameral mind, of the two lobes of the human brain. This configuration enhances the computer’s creativity, learning capacities, problem-solving, and enables it to reproduce the thoughts process of the human mind. Though simplified in its representation, Dan Brown’s invention closely echoes what is actually going on in the field of superintelligence, where brain scans, reproduction of neural networks and whole brain emulations are in the way of being performed by computers. Machine learning and artificial intelligence are the pivots of the dramatic turns of the plot, and, the novel suggests, they represent one of the major current scientific and technological challenges to the future of humankind. 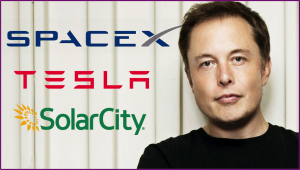 The hero of the novel, Edmond Kirsch, was arguably inspired by the figure of Elon Musk, the billionaire founder of Tesla and Space X. His biographer Ashlee Vance defined Musk «a sci-fi version of P.T. Barnum». He is the impersonation of a superhuman idea of capitalism, a techno-utopianism according to which science and technology are doomed to solve all the problems of humankind. Technological advancements are expected to extend human life, defeat diseases, extinguish famine. Still, the ideas of the techno-utopians are halfway between saving humanity and getting rid of it. Empowering the might of the human being to the point of overcoming its humanness. In the novel, Edmond Kirsch develops a form of synthetic intelligence which both enhances human capacities and threatens humans with its implacable logic. Winston, Kirsch’s artificial assistant, described as a sort of «Siri on steroids», plans homicides and crimes to maximise the impact of his creator’s work. Plus, at the end of the novel, E-Wave’s foresees human extinction in favour of a new species of intelligent machines, which absorb humanity in the process of endosymbiosis. Putting together all these suggestions, this is what I see from my first displacement: popular culture perceives and represents a huge mutation in which not just the continuity of what we know about the world, but the persistence of humanness itself is not guaranteed. Literature seems to propose itself as a device of elaboration of this transformation, and it offers a sort of guidance about the ethic, moral, and emotional implications of the paradigm-shifting revolution inspired by science. Literature can build a bridge between established forms of knowledge, that is, long-standing ways of imagining the world, and the overwhelming forms of living that rapidly transfigurates our present. Second displacement. 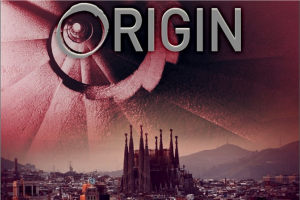 Origin is mostly set in Barcelona and punctuated by appearances of Antoni Gaudi’s art. 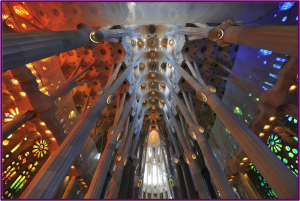 Observing Gaudi’s architectures, Edmond Kirsch finds inspiration for his theories on the origin of life. Indeed, the novel suggests the direct derivation of artistic shapes from natural and organic forms. 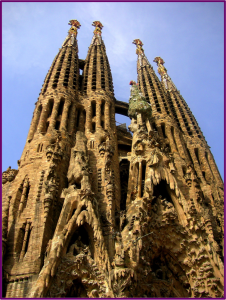 Being a visionary who rejects common rules, Gaudi is able to connect his imagination with the primordial dynamics of the natural environment. And to reveal how the patterns of biological life can inspire art forms. cosmically inspired helicoid columns, symbol-laden facades, magic-square mathematical carvings, and ghostly “skeletal” construction that clearly resembled twisting bones and connective tissue. And it is suspected to be «perhaps even […] a mystical shrine to science and nature». Gaudi’s art seems to be inspired by the biological code of human life. As in the case of the design of the tiles he invented for the sidewalks of the city of Barcelona. 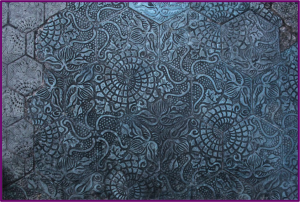 Each tile bore an identical swirling design of seemingly meaningless squiggles, and yet when they were all arranged and rotated as intended, a startling pattern emerged – an underwater seascape that gave the impression of plankton, microbes, and undersea flora – La Sopa Primordial, as the locals often called the design. Useless to say, the sopa primordial, the «primordial soup», is crucial for Edmond’s discovery. 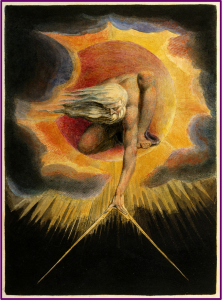 Edmond Kirsch manages to exhibit within the Sagrada Familia the first edition of William Blake’s Complete Works, open on the page displaying the God Urizen while he measures the heaven with a geometer’s compass. Blake’s visionary images of creation, cosmic perspectives, and human beings depicted in their bare, primary consistency, represent another possible reflection on the way in which arts bring back humanity face to face with the origin of its most basic questions and wonders about life and the world. Accordingly, another inspirational painting used by Kirsch is Paul Gaugin’s Where do we come from? What are we? Where are we going? Again, the vision of pristine humanity plunged in a pristine environment establishes a relationship between art and the fundamental experiences of humanity. Finally, a line from one of Blake’s poems is used as a password to give access to Edmond’s discovery: The dark religions are departed and sweet science reigns. Poetry discloses the secret of science. That is to say: art is a cultural language which encodes the functioning of nature. I argue that all these traces of continuity between science and art hint to a popularised version of a biological theory of art. Most recent findings in the study of art from a neurocognitive perspective (as for example summarised and originally re-elaborated in Alberto Casadei’s book Biologia della letteratura) stated that in the art can be spotted the biological underpinnings of human creativity. More precisely, art can be conceived as a device that captures biological and cognitive potentials (such as pattern recognition, rhythmic sensibility, sensory-motor responsiveness), and elaborate them to create forms that become significant precisely because they resonate with the body-mind of the observer, listener, reader. Art can be interpreted as the constant strain with which the human body and mind try to make contact with the world; it is the endless human attempt to grasp the environment and re-enact its forms and dynamics. This bodily and cognitive reproduction of the world constitutes the foundation of art, which begins precisely with the stylistic elaboration of the relation between the corporeal existence of the individual and the forces of the world. Ultimately, what I learned from my second displacement is that we could reinterpret the significance of art if we manage to reconnect it to the origin of life itself, to the biological constituency of humans. Third displacement. The final part of Dan Brown’s novel can be considered as a popularising essay on prominent scientific research. Dan Brown plays with the suspension of disbelief: in his novel, cultural, historical, and scientific insights are impressively accurate, and only slightly fictionalised. Or emphasised, as it is often the case in cultural popularisation itself, which is constantly engaged in making culture appealing to the general audience. The novel literally embodies the most popular formats of scientific divulgation. Edmond Kirsch’s presentation is an expanded and empowered Ted Talk, and the format of Ted Talks is explicitly mentioned in the novel. From Ted Talks Kirsch derives the tendency toward turning culture into a show. As Edmond puts it: «We’re a visual culture – multimedia presentations are always more gripping than some scientist talking at a podium». Not to mention the case of a literary scholar talking at a podium. Origin contains several cultural references, both summarising historical knowledge and quickly updating the reader about current knowledge, particularly on philosophy and science. From Darwin and Nietzsche to the already mentioned artists; from Stephen J. Gould’s evolutionary biology to Dawkins, Dennett, Stephen Hawkins, a number of actual books and theories are mentioned. The discovery itself that is at the core of the plot is based on an actual theory of quantum biology, elaborated by the young MIT professor Jeremy England. I won’t go into the details of this theory, I only say that it is based on the idea that the laws of physics themselves are enough to explain the origin of life. Particularly, the theory argues that the fundamental law of the universe is to spread and disperse energy. To obey this law, matter self-organises in the effort to better disperse energy. In fostering the production of disorder, nature creates little structures of order. The world is built upon the creation of dissipative structures. And living organisms are among the most powerful of these structures: life is an exceptionally effective tool for dissipating energy. As Edmond puts it: «Life is not the point of the universe. Life is simply what the universe creates and reproduces in order to dissipate energy». Despite this theory ultimately claims it wants to disrupt religion, the novel proposes a comforting conclusion in which a new, enlightened religion and the major discoveries of science could path the way for a possible consilience between the two worldviews. However, the almost happy ending belongs to the needs of the feuilleton, of the popular novel, and it’s hardly the point of reading this work. Though, I’d like to suggest that the point of reading Dan Brown’s Origin could be to apply a similar idea of consilience to the relationships between literature and science. Within the novel, art is asked to reveal the origin of life, to remind humans of the forces crossing the universe, to provide guidance into both knowledge-related and practice-related mutation we are dealing with. The ancient myths about creation are recursively mentioned as they contain imagery of energy and light spreading out infinitely and illuminating the darkness. Thus suggesting that the secrets of science are somehow encrypted in art. Langdon last gaze to the Sagrada Familia seems to confirm this idea. As Langdon advanced through the basilica, his eyes took in one organic form after another, finally ascending to the latticework of cell-like structures that made up the cupola. This central ceiling, some claimed, resembled a complex organism viewed through a microscope. Seeing it now, aglow with light, Langdon had to agree. Art makes visible the invisible force and intention entailed in nature. As the novel points out, the energies of nature shape human constructions, ideas, believes. Following the instruction of natural laws, the human mind shapes order out of chaos. Or, in Langdon’s semiotic terms, it creates codes, which are the deliberate inventions of intelligent consciousness, emulating natural patterns. What I learned from my displacements out of the comfort zone, is that absorbing insights from science, art and literature can mediate between the human being and the cosmos, understood as both the natural environment and the social environment. Origin does it in a superficial, sometimes banalising fashion; though, it flags a possible ambition for literature, which can escape its current marginalisation by stating its capacity of elaborating fundamental human experiences in a specific and non-replaceable way. Further examples of recent, successful literary works seem to take-up this challenge by assuming at a deeper level the reflection on the human position within the environment and the physical world. Jeff Vandermeer’s Southern Reach Trilogy embodies in its writing and style the attempt to represent the drives of natural forces through language; it powerfully succeeds in shaping language according to the dynamics of biology, while representing an overwhelming mutation that opens up the human-environment relationships to unexplored possibilities. Ultimately, art can make humans perceive both the forces that created the world and the forces that are continually changing it. In doing so, it can also provide orientation on how we can face these forces, on how we can shape them and not just be shaped by them. This entry was posted in Prose, Texts, Uncategorized and tagged Alberto Casadei, Antoni Gaudi, artificial intelligence, Ashlee Vance, Barcelona, Barcelona Supercomputing Centre, Bilbao Guggenheim Museum, Biologia della letteratura, biology, Casa Milà, Charles Darwin, Dan Brown, Daniel Dennett, Elon Musk, Friedrich Nietzsche, Jeremy England, machine learning, Mare Nostrum, Montserrat, neural networks, Origin, Paul Gauguin, Richard Dawkins, science, Stephen Hawkins, Stephen J. Gould, superintelligence, technology, Ted Talk, Urizen, whole brain emulation, William Blake by Paolo Gervasi. Bookmark the permalink.